My first trip to the Mall of Memphis came in the early 1980's - I am not sure of the exact year. As odd as it may sound, the Mall of Memphis was important to me and meant something personal - as much as a mall can I suppose - indeed, I visited the mall so often and over the course of so many years that I feel that I kind of grew up within its retail-laden walls. Because of this, I'm glad to have the opportunity to post a few thoughts here. As a teenager who had not yet learned how to drive, the mall was a fantastic, sprawling, city of unique shops and major department stores. I remember "living" at the Ice Chalet and the Gold Mine arcade just across from it. I spent my dollars buying collectibles like D&D modules and hobby items from a great store in the east end of the mall called Toys by Roy. And, a trip to the mall wasn't complete without a stop by the Mrs. Fields cookie shop for a peanut butter cookie and a cup of milk. A great deal of thought was put into the design of the ice rink. It was the crowning jewel of the entire mall for certain. I've been to many cities over the years and the ice rinks I've seen have had no "style" to them. Three major details made the Ice Chalet so incredible. First, the developers of the rink must have visited an aquarium prior to drawing their first design sketches because the beauty of the Ice Chalet was that it put its visitors within a ocularly joyous fish bowl. Not only was it built by the main entrance to the mall so that any patron walking through the front doors would be forced to view the happy people gliding in graceful, and sometimes not so graceful, circles, but it had two other unique characteristics. The Mall of Memphis was a two-story mall and the designers placed the semi-circular food court upstairs and around the ice rink. Waist high rails surrounded the rink from above and hundreds of seats and tables encircled the area so that those eating from above could look down below onto the rink. Attached to the ceiling that hovered over the rink, seasonal, banners of enormous bolts of fabric were hung. That, in and of itself, made the rink great and the Ice Chalet would have been far better than most rinks, but the designers took that extra step to take the rink to a whole new level, one that made it something special. See, most rinks have a dead wall at one end of them - just a high wall, usually with a scoreboard and a place to hang a banner or two. But the Ice Chalet had no walls. The east side was open to visitors coming though the main entrance. The north side was open to patrons walking the main east/west hallway of the mall. The west side was the area that you entered to skate. But the south side was the best. Instead of butting the rink up against a wall, the designers decided to build a bar/restaurant at the end and curve the wall of the restaurant to match the curved end of the ice rink. Instead of a wall, the builders put in 10'-12' high plexi-glass windows so that even the bar patrons could look out upon the rink. The bar that inhabited that space was called Chelsea Street Pub. A tiny stage inside allowed for a small set up of live music and it was always packed! It was the best! I remember sneaking in with my girlfriend when we were far too young to do so just to hear the bands. On a Friday or Saturday night, the mall was packed with a throng of patrons and kids. So many things were going on simultaneously at the Mall of Memphis and that's what made it so great. A live band was blowing out tunes from Chelsea Street while close to one hundred skaters cut counter clockwise circles in the ice while being viewed from all angles. Shoppers hit not only the main anchor stores but a host of specialty stores as well. One of my favorite specialty stores was called the Tinder Box. It was a pipe/cigar store but also sold all kinds of collectibles from plates to pewter pieces and other bric-a-brac. As I grew older and became an adult, I visited the mall with less frequency than that of a teenager and I watched the slow death of the Mall of Memphis throughout many years. The toy store went quickly and even the pub went too. The arcade moved across the hall and into the area formerly used for the bar. But once the main stores pulled out, the specialty stores just died. Specialty stores can't stay in business without having traffic drawn past their doors by patrons of the larger stores. With less traffic, the number of skaters dwindled too. I recall walking through the main entrance doors on a Friday night sometime in January of 2001 and the place was a ghost town. As a previous person posted here, many urban shops had begun to fill in the gaps of the missing stores but, again, they too were specialty shops in their own way and without the support of major name department stores, those shops were doomed from the beginning. I imagine that every person has a mall to which they feel connected. I guess that my sentimentality regarding the Mall of Memphis stems from the years of my youth that I spent there. As a 38 year old adult, I spend very little time at malls now. When I do, I am usually going to purchase something and am not there to revel in the experiences and stimulation that a sensory overloading mall can provide to a young person. And that is why no mall will every again ignite the memories that this mall did for me. I too have fond memories of the Mall of Memphis. As a child, I lived outside of Little Rock and we would take trips to Memphis about twice a year. In the mid and late 1980's, the mall was always full of shoppers and all of the tenants were full. The mall had 4 anchor stores including Dillard's, J.C. Penny, Service Merchandise, and a Thalheimer's, about 180 specialty stores and kiosks, along with a large food court above an ice rink. One store in particular that we visited every time was a shop on the first level just outside of J.C. Penny. This store was a Popcorn Shop. They sold all kinds of popcorn. My favorite was the rainbow colored, candy flavored popcorn. This store remained until the mid 1990's. Throughout the years the mall kept going strong. In the early to middle 1990's, crime and vandalism started to strike the mall. Due to this the mall underwent a renovation. The mall that once had the 1980's brown and orange look was transformed to the pastel green look as can be seen in Steve's photos. They also had added a glass elevator in the center of the mall to replace a passenger elevator that was hidden in a cove and was a good place for criminals to hide and wait on unsuspecting shoppers. Shortly after the renovation, Thalheimer's closed its doors. Quickly Dillard's snatched up the space allowing them to make the new store the men's store and leaving the past store as the women's and furniture store. The mall once again was strong and full of shoppers. Crime in the area still was higher than other parts of town but still was not in the worst area. Occasionally there were murders from robbery attempts and several car jackings from the malls parking lot. This doesn't say much being that a murder took place at the Oak Court Mall in the late 1990's. Oak Court being in a much nicer part of town. The main part of the destruction of this mall came in the late 1990's. Service Merchandise held on to their spot until the company shut down their last stores. The store closed and no one else ever took it over. The signs were even left on the store and were still there when the mall shut down. The newest mall in Memphis, The Wolfchase Galleria, opened its doors. This mall is no larger than the Mall of Memphis but it is located in the much nicer Germantown/Bartlett area. This drew many of the shoppers over to this mall causing some of the smaller stores in the Mall of Memphis to shut down. The ethnicity of the shoppers changed drastically during this time and the smaller stores were being replaced with local urban-style shops. These shops would come and go as the years went on, and slowly the mall would have the boarded up spaces throughout the mall with the Mall of Memphis's logo on it. In summer of 2002, I visited the mall and the J.C. Penny store had a storewide closing sale. Also the Dillard's that took over the Thalheimer's was also having a store-closing sale. There were still several small shops and eateries in the food court and the ice rink was still open for skaters. I made it to the other Dillard's store and it too had all items marked down for a store closing. All of this was a shock to me considering I did not think that this was in that bad of a area of town. The inside of the mall still looks practically new and was very well kept. I now live only 45 min from Memphis so I watch their local news. It was in fall of 2003 that it was announced that the last day of business for tenants remaining in the mall was going to be Christmas Eve 2003. I was wanting to go before they closed and take some pictures but never was able too. I would like to thank Steve for taking some photos and preserving this memory of mine and memory from many many more who visited this mall. My first encounter with the Mall of Memphis was the summer of 1989. At the time, it was busy, and the parking lot was packed. I returned to Memphis in 1993, and the mall was still healthy, though it had begun to acquire a reputation that eventually led to its demise. Of course, the Mall of Memphis in its heyday boasted full occupancy, one of the largest Dillards stores east of the Mississippi, the most retail space in the South, an ice rink, and much more. The second story of the mall actually used to quake when it had a large number of people walking along it. This was, however, part of the mall's design rather than a defect. Being male, I'm not much of a shopper. However, I do have some fond memories of this mall. The food court on the upper level looked down upon the ice rink allowing diners a perfect view of the skaters. I even took a few dates to the movies at the cinema and skating at the Ice Chalet, which is a fond memory even though I spent most of those dates falling on my rear end as I could never get the hang of those ice skates! The inside of the mall was designed to look like a city's main street. However, it became much more like a main street than anyone ever intended. As I mentioned earlier, the mall had a terrible reputation by 1993. I don't know if this is where it started, but, the year before, a store manager was shot and killed one evening in the parking lot in a botched robbery attempt. I remember several of my friends in Memphis advising me not to take a date ice skating at the "Mall of Murder." Although I left before this time, I've been told the mall began to suffer before the Wolfchase Galleria ever opened. The reputation for crime was scaring more and more people off, and crime increased as more people were scared off. Before the end, several murders, and even a suicide or two, had occurred inside the mall. 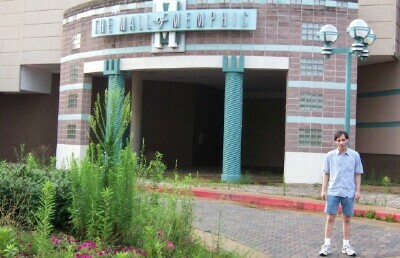 When I made a return trip to Memphis in 2000, I avoided the Mall of Memphis, because of the crime, even though I needed to visit a department store. I visited the Oak Court Mall instead. My friends would probably have said I wised up, and many of the store owners might have agreed. I've been told Dillards and JC Penney left a year later, and the mall began to suffer very severely after that point. Of course, I didn't know all of this when I made a return trip to Memphis in May 2003. I took the old bridge into town and caught the I-240 loop around the south side of town to take me to my Germantown hotel. On my way, I just happened to look to my right before the Perkins Road exit, where I saw an empty parking lot surrounding a huge, empty building. I immediately knew what I was looking at, and I exited Perkins to take a look at the Mall of Memphis. I was saddened by what I saw. The welcome signs had faded, and the cinema marquee was falling apart. The marquee simply said, "Ice Skating Inside." When I drove around to the cinema, it had been boarded up. Scars of the old Dillards logo were visible, and the old Service Merchandise logo was completely intact. The county apparently had a few offices in the mall, but tenants were few and far between. Since my visit to Memphis, the Mall of Memphis has closed for good. Its last day of business was Christmas Eve 2003. Odds are that it will be boarded up shortly. As Alpha mentioned, the locals, aside from a few disenfranchised ice skaters, don't have much sympathy for the place. As far as they're concerned, it's good riddance to the Mall of Murder. Plenty even hope the mall gets torn down, and their fear of the place can be buried with the building. I, however, say, "Goodbye, old friend, and thanks for the memories." Memphis seems to have its share of malls. Out in the suburbs, there was the brand-new Wolfchase Galleria. In the slightly nicer part of town, there was the smaller Oak Court Mall that seemed to cater to the nearby population. There were two malls left on my list: Mall of Memphis, and Hickory Ridge Mall. Mall of Memphis (even the name sounds like it's the top dog) was right next to the freeway, and wasn't too far from the nicer part of town. I immediately assumed it was going to be an absolutely large, healthy mall that was clearly THE shopping destination in Memphis, and the description (somewhat out of date) mentioned it featured an Ice Rink, and a Cinema Grill. Hickory Ridge Mall I expected to be pretty close to dead, as it was quite a good ways from the freeway, and didn't seem to have any sort of good economic base. With that knowledge, I headed off to Mall of Memphis, and to my surprise, the place was deader than a doornail. Actually, not quite that dead... there are a few small stores clinging to life, and the Ice Rink. But it had lost all 4 of its anchors, and the parking lot was mostly empty. The mall opened in the early 80's, from what I can tell. I'm not positive as to what its original anchors were, but I'm assuming they were JCPenney, Dillard's, Goldsmith's, and Service Merchandise. At 2 stories and about 180 stores, with easy visibility and access from the freeway, this Mall was the top dog in Memphis. Somehow, its anchors dropped away. From my assumptions, Goldsmith's left first, and then Service Merchandise closed around the time of their bankrupcy (their logo is still attached to their store, and it was a recent one, so they didn't leave all that long ago.) Then the mall started to falter, and JCPenney and Dillard's were the two remaning anchors. A mall this large with only 2 anchors is going to start losing tenants, and something tells me this is when a good deal of stores left, although I can't say that for sure. Around this time the mall was redecorated, with more of a 'hip' theme, featuring colorful pastel corrugated metal accents. It didn't help. Dillard's and JCPenney, its final anchors, both closed sometime around late 2001, early 2002 , and that has left the mall in its current state. Whatever way this mall did die, it was rather quickly, because a good deal of the storefronts were not covered, and it was obvious that not too long ago, this was a Class-A mall. Perhaps what's interesting most about this mall, is WHY it died. It was, by far, the most accessable mall in Memphis, and was more centrally located than the new Wolfchase Galleria. Most people speculated that Wolfchase Galleria killed Mall of Memphis, but I have my doubts. For one, a good deal of Memphis' population base was closer to the Mall of Memphis than the Wolfchase Galleria, and the Wolfchase Galleria is the same size as the Mall of Memphis. Also more bizarre: Why would the Wolfchase Galleria kill Mall of Memphis, but not the nearby Hickory Ridge Mall, which was smaller, and had to draw from its local economic base? My assumption would either be bad management, or some sort of crime in the area. Although it's obvious that the Mall of Memphis isn't exactly in the most economically healthy area, it didn't seem run down or unsafe. Not much is mentioned on the death of this mall... to be honest, the mall doesn't seem to get much sympathy from Memphis residents. The Ice Rink is still open, but not much else. I have no idea how much longer it is until they seal off the place, but enjoy it while it lasts, because there doesn't seem to be much future for this mall in its current state.